(CNN) - As the race to fill the seat of the late Democratic Sen. Frank Lautenberg gets underway, the first two polls in the contest indicate Mayor Cory Booker of Newark, New Jersey, with large leads over his rivals. Lautenberg died last Monday at age 89 and was buried on Friday at Arlington National Cemetery. Last Tuesday New Jersey Gov. Chris Christie announced plans to hold a special Senate election this year, with the Democratic and Republican primaries on August 13 and the general election on October 16. The winner would serve the final 14 1/2 months of Lautenberg's term. An election to a full six-year term will be in November 2014. 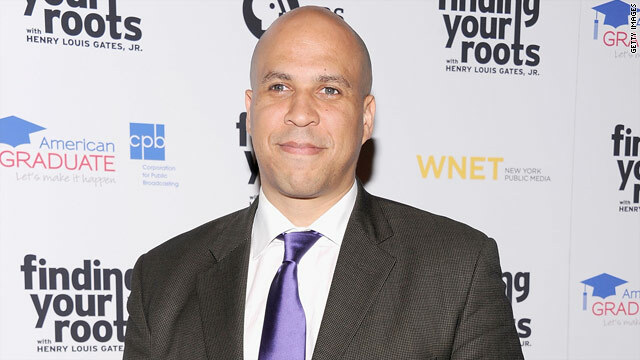 Booker, considered a rising star in the Democratic Party, announced his bid on Saturday. Rep. Rush Holt, who's in his eighth term representing New Jersey's 12th Congressional District, jumped in Thursday. Rep. Frank Pallone, in his 14th term representing the state's 6th Congressional District, is expected to formally declare his candidacy on Monday. According to the Quinnipiac University poll, which was released Monday morning, 53% of Garden State registered Democrats say they back Booker, with 10% supporting Holt , 9% backing Pallone, and nearly a quarter undecided. State Assembly Speaker Sheila Oliver also jumped into the race over the weekend. And a Rutgers-Eagleton survey released Monday afternoon had similar numbers. On the GOP side, former Bogota, New Jersey, Mayor Steve Lonegan is the only major candidate to announce a bid for Senate. The poll indicates Booker topping Lonegan by a two-to-one margin, with Pallone leading Lonegan by ten points, and Holt with a five-point advantage over the Republican, in hypothetical general election matchups. Fifty-seven percent of Garden State voters have a favorable impression of Booker, with 14% holding an unfavorable view and one-in-four not knowing enough about the two-term Newark major to form an opinion. Two-thirds say they don't know enough about Pallone or Holt to form an opinion, and more than six-in-ten say the same thing about Lonegan. "It's Newark Mayor Cory Booker in a runaway in this first look at the special election to fill the U.S. Senate seat held by the late Frank Lautenberg," said Maurice Carroll, director of the Quinnipiac University Polling Institute. "Who are those other guys? The record shows that Congressmen Frank Pallone and Rush Holt are big in their districts, but, state-wide, no one knows them. Steve Lonegan gets the close-to-one-third Republican vote against any of the other three. He's up there with Pallone and Holt on the anonymity scale," added Carroll. Christie on Thursday appointed state Attorney General Jeffrey Chiesa, a fellow Republican, to serve as interim senator until the October election, but Chiesa said he won't run for the permanent seat. Chiesa gets sworn in to the Senate Monday by Vice President Joe Biden. Christie is up for re-election in November's regularly scheduled general election. The Quinnipiac survey indicates he continues to lead his Democratic challenger, state Sen. Barbara Buono, by a two-to-one margin (59%-29%). The Quinnipiac University poll was conducted Thursday through Sunday (June 6-9), with 858 New Jersey voters, including 306 Democrats, questioned by telephone. The overall survey is plus or minus 3.4 percentage points, with a margin of error of plus or minus 5.6 percentage points for questions only of Democratic voters. Look, up in the sky! It's a bird. It's a plane. No, it's a politician! It's Bookerman. Why even have an election? I hope he stands for the people like Elizabeth Warren. Other than Bernie Sanders, I think shes been the most positive (for the people) addition. I hope Booker is the same. Vote for the gop if you want to pay congress men to do nothing like they have been doing for the last five years . Oh yea, they had 37 useless votes to repeal obamacare at 1.5 million dallars a piece of your tax. Money .vote dem and get something done !!!!!! Mayor Booker has built up a reputation of being some thing of local super hero in the Gotham City of Newark, NJ. He rescues old ladies from burning buildings and other heroic acts. I, for one, would be anxious for him to bring his super powers to the US Senate. Maybe he can save it from the cliff it's falling off.....and the House, too, while he's at it. I believe (Hope) Corey has a level head on his sholders. Didn't he take a slap at Obama a while back? The only question is, who wants to sit in the Senate if Harry is still in charge? I think I like Corey better than Elizabeth. cory is hands on. His courage is unquestionable and he is a smart compassionate guy. He will be an asset to the state. Does two half terms in the Senate and mayor Newark make a good presidential candidate?